Sometimes it’s wonderful to wear an outfit that doesn’t consist of complicated, flowy components (loose cardigans & a-line skirts, I’m looking at you!) and that all fit ‘just so’. I’m loving this wonderfully detailed YesStyle trench that helps elevate simple combinations such as this one into something a little bit more special. I wore this out for lunch with a friend, then to take a few photos for the lovely Alicia’s 4th Blog Anniversary and to run some errands – all with flats in my bag for lengthy walks, of course. Happy Monday! Another classy, chic look Jen! I’m looking for a trench, so tks for posting! That trench was made for you, fits you perfectly! Adore that bag! 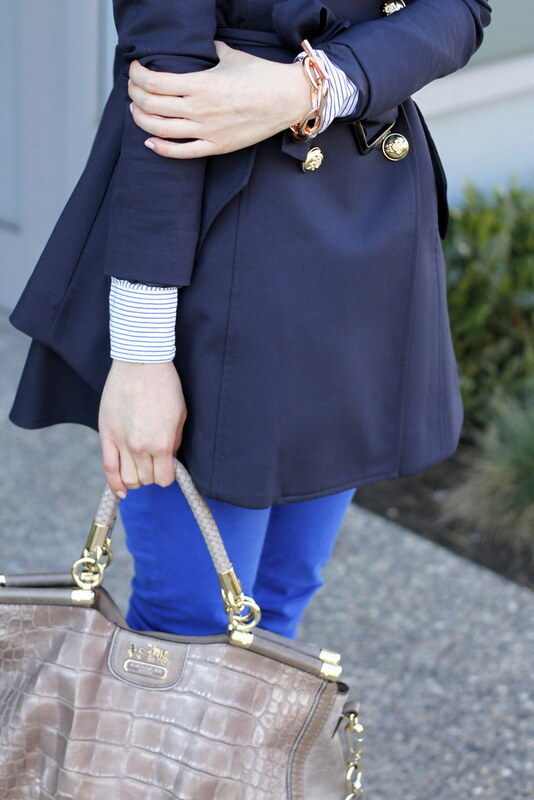 Love the trench coat with the bright pants and stripes! Looking adorable as usual missy! This is such a cute outfit. Classic with some twists. 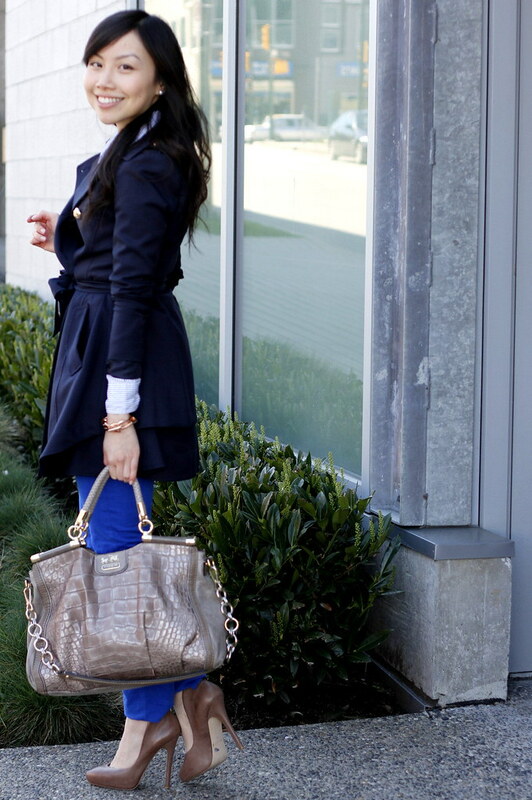 I love the trench coat and the bright blue pants underneath. You look adorable! I love everything about this love! I totally know what you mean…sometimes it’s nice to just take it down to basics and keep it simple. Though this “simple” look is still beyond stylish thanks to all the great details, and seriously that second pic of you…stunning! Profile picture much? Haha. Hope you had a great weekend friend! Sometimes simplicity really is best! Usually spring brings out my desire to streamline my look. You look great here–everything looks like it can just be thrown together without thought, but the result is so polished. I love the simplicity of this look (even though the jacket alone is not simplistic in any way. Just look at that lovely cut and silhouette that it gives!). i love a good preppy look, nice work jen! I am in love with that coat. The whole outfit is lovely. Love this classy look. I love the colors that you used. I love the bag and the color of your shoes! The trench is the perfect feminine shape on you. The mixing of blues looks beautiful 🙂 I was just in las Vegas and carrying flats in my bag at night is what saved me! I agree, simple but classic outfits are sometimes the best! And of course, an extra pair of flats as well 😉 This trench coat is truly beautiful, I like how it’s layered in the back.